This post was written by Tim Jordan and originally appeared on his blog, Speaking My Yoga, on November 17, 2018. It’s been reproduced on the Zen Peacemakers Journal with Tim’s permission. Amazing, powerful, life changing, are some of the adjectives that come to mind when I reflect on my week at Auschwitz. Amazing, to see and experience so much beauty in the midst of so much darkness. Powerful, in the expansion of my inner capacity to hold such suffering and pain. Life changing, in finding this new anchor, the 3 tenets: Not Knowing, Bearing Witness, and Taking Action. What is most alive for me as I write this is a feeling of love, of tenderness, of softness. My skin even feels sensitive. My breath is slow and shallow. I have a sense of fullness and richness. I want to sing, and chant. I feel incredibly honored and humbled to have walked the sacred grounds of Aushwitz-Birkaneau and listen to the soil, as Father Manfred instructed us to do on the first day. I feel a sense of urgency and responsibility to share my heart. Reading about the 3 tenets prior to the retreat, I thought, Ok, I’ve got this. Pretty simple instructions. This should be easy enough to do. I’ve studied the holocaust for years, I’ve meditated for years. I’m ready. And yes, I WAS ready, at least in terms of my intention, my focus, and desire to know more. But I really only had an intellectual understanding of Bearing Witness, I had not embodied it. I wasn’t sure that I could, actually. The horrors are unimaginable, and I was sitting face to face with them. Most haunting was looking into the faces, the eyes, of pictures of the prisoners before they were murdered. I forced myself to stop, and not look away. I stood at the execution wall and offered a candle of remembrance and tried to feel their terror. Then there were the shoes, the hair, the gas chamber, the ovens, the torture rooms, the barbed wire fences, the cattle cars, and on and on. Can I bear witness to all of this? Can anyone? I learned that stepping into this practice, painful as it is, is what I have to do. I have to do it, because if I don’t, who will? 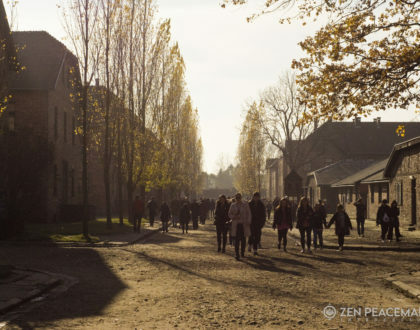 Bearing witness is not simply observing what happened at Auschwitz, but it’s actually listening to the screams, feeling the terror, witnessing the horrors, walking the path to the gas chambers, even standing on the lookout tower with a gun. It’s putting myself there on the grounds, in all of the different roles, with everyone–prisoners, as well as guards. Bearing witness is being truly in it, and not moving. Not thinking of something more pleasant, not leaving. It’s staying put and letting it all wash over me. By bearing witness, I honor the sacredness of the lives that were lost there. I honor the Sacred. On the last day of the retreat, just when I thought there was nothing more to learn, it seems I had my greatest teaching. I stood on the path the prisoners walked to the gas chambers and shared with the group what I had felt earlier that morning. Our session began with the men gathering in the men’s barracks and the women in the women’s barracks. This gender separation, while making sense on one hand, made me a little uncomfortable on the other. I thought of the men in those barracks who were forced to be with men, when perhaps they wanted to be with the women. What about these men who identified more, and felt safer, with women rather than men? Men, who were perhaps not known to be gay, or forced to wear the pink triangle. But men who were known only to themselves to be gay. Hidden, invisible, terrified. I wonder how they would be received among their fellow prisoners if this were discovered. Would they be the hated among the hated; the outcasts among the outcast; the lonely and isolated, among the lonely and isolated? Who would listen to them? Who would include them? Who would reach out to them? Who would want to sleep next to them? I felt the anguish of these men. I did not turn away. Then I sat down beside the barracks and wept. So, to these brave men, I bear witness to your unimaginable suffering, sadness, loneliness, and terror. Unsure which breath would be your last. Unsure if you would be found out, betrayed. Maybe no one has heard you before, but on this day someone did. I hear you. I feel you. I honor you–your life, your death. You are not alone. I am with you. Many of us are with you. We hold you up, we hold you. Tim Jordan is a Yoga teacher, Kirtan leader and blogger who was raised in Mississippi, United States. This post has been reproduced from his blog, Speaking My Yoga, with his permission. Visit Tim Jordan Kirtan to learn more about him.